Information sheet will be mailed with runner's bib. Additional information about Security and Safety is also posted below. This information page will be updated as changes and security issues warrant. Keep checking back. On behalf of the Race Committee and the Friends of the Spring Lake Five, we would like to welcome you to the 42ndAnnual Spring Lake Five Mile Run. This information sheet, along with your race bib number (with attached timing tag) and other enclosures is being sent to you in advance of the race in order to reduce confusion on race day. Please take a few minutes to read this information sheet and familiarize yourself with the instructions below. The race will be held rain or shine. PARKING is limited - arrive early • streets east of Third avenue will be closed @ 7:30am to parking. Note that Ocean Avenue at the start and finish areas will be closed to traffic on race morning. DO NOT ATTEMPT TO DRIVE INTO THIS AREA! Please observe Spring Lake’s parking ordinances. There will be NO parking along the entire course - all cars parked on the course WILL BE TOWED. Your race number bib is enclosed. It MUST be pinned to the front of your shirt on race day. Your timing tag (B-Tag) is also affixed to the back of the race number. Do not remove the tag. Be sure your race bib is clearly visible on the front of the torso (not covered), unaltered and unmodified (do not fold or wrinkle), and pinned in all four corners. You must wear your race bib and B-Tag or you will not be scored or receive an accurate time. Be sure to bring bib number to the race. If lost, bring a copy of your registration confirmation e-mail. Transfer information can be found on the race website: using another person’s bib number without a formal transfer will result in both runners being banned from future events. You may pick up your shirt on race day morning from 6:30 am until 10:30 am at the T-Shirt Tent. To avoid the long race day lines you may pick up your shirt prior to race day. Shirts, glasses and calendars may all be picked up at the Spring Lake Train Station. Please see schedule that follows for pick up hours. You must bring your actual race number bib with you in order to pick up your shirt. The size & type of shirt selected on your entry will be size given out. NO EXCEPTIONS. Your Bib Label determines which type of shirt you ordered for the race. White labels are for the cotton shirt, Yellow labels are for technical men’s shirt. Pink labels are for women’s technical shirt. Shirts must be picked up by 10:30 am race day – no mailings. Every entrant in the five mile race will receive a commemorative glass and calendar. 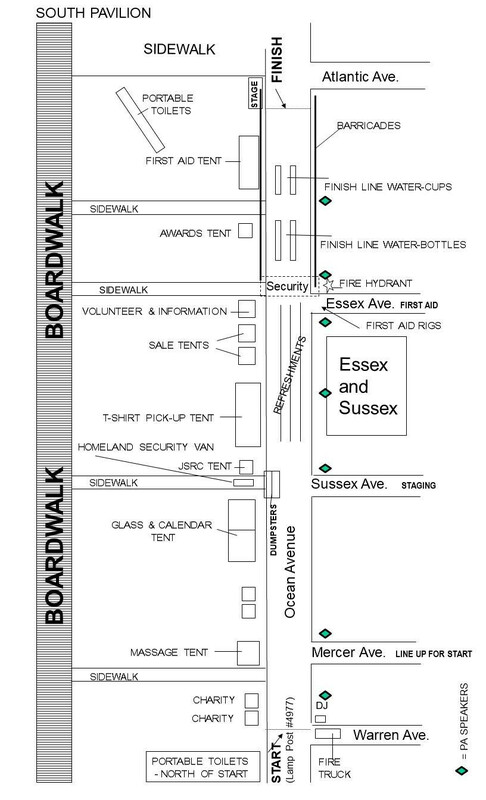 You can pick up your glass and calendar at the pre-race packet pickup (see info under T-Shirt Pickup) or on race day morning at the Glass and Calendar Tents, north of the T-Shirt Tent (see map below). Start time is 8:30 am. The start will be located between Sussex and Mercer Avenues. Please arrive at the starting line ten minutes before the race begins and pay attention to the directions of the starting line officials. Position yourself at the starting area according to your expected finish time and pace! Your pace is printed on your number bib. This is the most important thing we ask of you. You MUST show a designated bib to our security team to allow you to start in the front rows of the race. Do not start in the front of the race unless you have the ability to be a top finisher of the five mile run. Doing so is a danger to our elite athletes who train all year. Security tapes are reviewed and necessary actions will be taken to ensure the safety of the runners and that this does not occur in the future.The start of a race this size can be very difficult and we ask your cooperation to ensure everybody’s safety. All Runners must cross the starting line mats on Ocean Avenue to get an accurate finish time. If you are starting on the Boardwalk, you will not receive a net time. The course is fast, flat and certified by USATF. The race course will be the same as last year’s course. There will be a digital clock at each mile. Course map is posted HERE. There will be four water stops on the course, as well as at the start/finish area. Water stops will be located on both sides of the street at each mile marker. Be sure you are well hydrated! Racing in warm weather can be dangerous if you do not use good judgment. Be careful. If you feel overheated, slow down! No race is worth physical injury. To ensure the safety of the runners and the children, baby strollers, roller blades and bicycles will not be allowed. We prohibit strollers because we worry about the well being of the children in those strollers and your safety. We ask for your cooperation. The use of headphones and ear buds is not permitted. You have to be able to hear instructions from Police, Homeland Security, First Aid and Race Officials. Any runner viewed on camera crossing the finish line with them will be subject to disqualification. Port-O-Johns are located at the corner of Ocean and Atlantic Avenues, near the race finish line. A few units are also located along the course. The medical tent will be located at the finish line at the east end of the finish area. In addition, the course will be monitored by local First Aid squads. First Aid personnel will be present at several areas on the course. One problem that occurs with a race of this size is that some runners will attempt to run unofficially. If you know anyone who is thinking of doing so, please persuade them not to participate in the race. Their presence will clog the start, finish, water stops and refreshment tables. Their participation makes your race less enjoyable; please help control this situation. Unregistered runners are prohibited from running the event. There are Homeland Security and First Aid identification policies that we have to follow. If you are a registered runner, and find that you cannot make the run, the Spring Lake Five has an OFFICIAL transfer policy in place; please send an email to SPRINGLAKE5@SPRINGLAKE5.ORG requesting current transfer process. Transfer opportunities for 2018 will be limited. Using another person’s bib number without a formal transfer will result in both runners being banned from future events. Post-race refreshments, for participants only, will be available in the finish area. Please be considerate of those finishing behind you and take only what you need. This year's race will feature Jersey Mike's Subs. There will be a large digital clock at the finish line. When you cross the finish line and the series of transponder mats that determine your net time, keep moving. This allows room for others to complete their runs. Do not re-enter the course or cross the chip mats at the finish a second time. Pay attention to the instructions of the finish line personnel. Look at the clock for your time as you finish. All unregistered runners will be disqualified and ineligible for any awards. Top men and women have separate finishing chutes. Women will finish on the left and men on the right. Medals will be presented at the end of the finish area to all official finishers. An awards presentation to the male and female champions will be conducted immediately after they finish the race. Awards will be given to the first ten men and women finishers as well as the first male and female Spring Lake residents. The top 100 men and 100 women should use their finish card to redeem mugs at the awards pickup tent immediately upon finishing the race. Results will be available on the race’s web page at www.springlake5.org. Race photos are provided by Island Photography. Parkway to Exit 98. Follow signs for Rt. 34 South. Take Rt. 34 South to circle. Get on the circle & follow signs for 524 East (Allaire Road). Take 524 East to Ocean Avenue (approx 5 miles). Take a right on Ocean Avenue, approx one mile to start. - ALTERNATE ROUTE Route 195 or Parkway Exit 98. Follow signs for Rt. 138 East. Take 138 East to end. Take Rt. 35 South to first light. Take left at light onto 18th Avenue. Straight to the 2nd light (F Street). Take right at F Street. Take F Street into Spring Lake (becomes 3rd Avenue). See course map for start location. A race of this size could not continue without the help of many people. The volunteers who give of their time and energy are unsung heroes. They deserve your cooperation and gratitude. In addition, we are indebted to our sponsors and area organizations for allowing us to give the runners the best possible race. All of these organizations and people deserve your thanks and support. The support this race receives from the Borough of Spring Lake is invaluable. Many thanks are due to the Spring Lake First Aid and Fire Companies, the Spring Lake Borough yard, the Spring Lake Police and Homeland Security. The proceeds from this race are donated to various local charitable organizations. Please see our website for more details. This race, founded in 1977, was one of the first in a wave of road races in the shore area. From an original field of 400, it has grown into the largest race in the state and one of the largest 5 mile races in the country. Once again, the Spring Lake Five Mile Run has been named one of the top 100 races in the country by Runner's World Magazine. This growth has been the result of the cooperation that exists between the runners, the organizers, and the people of Spring Lake. This race draws a special mix of runners from all over. It is an event where both the state’s elite runners and the first time joggers may participate. Click here for additional race history. Check website for list of past winners. This race has been blessed with a large number of dedicated volunteers. As the race grows our need for people also grows. If you know anyone who wants to help out on race day, please have them send an email to springlake5@springlake5.org. The following security measures apply to all participants, volunteers and spectators. Participants and Spectators, it is important to be aware of Security and Safety measures at the Spring Lake Five - in light of recent events around the country. See Something Say Something – if you see something suspicious please contact the nearest Police, Security Team Member or Homeland security officers who will be stationed through the area, or call Spring Lake Police Department at 732-449-1234. NO backpacks are allowed, there is no baggage check. Coolers and personal tents are also banned. Spectators bags or purses will be subject to searches by security; spectators should leave all bags in their vehicles. Obey all signage at the race, i.e. "Keep Out" means "Keep Out"
If possible pickup your t-shirt and goodie bag before race day and avoid long lines with the additional security measures in place. All runners are assigned and must wear micro-chipped bibs - these Bib numbers must be visible on the front of your body at all times or you will be removed from the course. Runners are to line up according to the pace printed on the bib. To ensure the safety of elite athletes, only designated runners will be permitted to line up in the front rows. NO Bandits (unregistered runners) allowed - You must be the person assigned to the bib number, especially if an emergency occurs. Homeland Security and EMS will have a list of the registrants with their assigned bib numbers with the emergency contact numbers. NO Headphones - you must be able to hear emergency personnel and security. NO strollers allowed – the race is too crowed to push a stroller of any kind. NO Drones - the entire race course is a "no drone zone". Do not linger near the Finish chutes please keep moving past the medal distribution area to the refreshment area as directed by Security Teams - The finish area needs to be kept as clear as possible for emergency personnel.